We're so excited to be adding a new member to our family! Thank you so much for taking a look at our registry and we hope you can join us in the fun for bringing home baby! If you purchase anything from Cribs and Kids, you will be redirected to MyRegistry.com and then to their website. This ensures that it is synced with their in-store registry. You can also go to their brick and mortar location to purchase in person. This is the only remaining baby store in San Antonio with a wide variety of selection and even better, they are locally owned. They have helped guide Kyle and I through this process, and have been super easy to work with. If you go in store, they will have all of our items separated for easy selection. 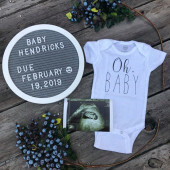 Again, thank you all so much and we can't wait to meet the little one!